Code Enforcement Officer Mike Lissow provides Building Inspection, Code Enforcement and Fire Marshal services for the residents, business owners, landlords, and property owners within the Village of Hilton. Mike’s other responsibilities also include Stormwater and the Village of Hilton Zoning Board of Appeals. A building permit is required for all construction; (sheds, pools, decks, fences, garages, additions, alterations-remodeling, completion of second floor and basements, demolition, new building, removal and repairs). Permit fees vary. 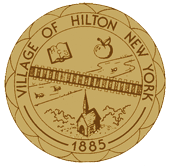 Any new construction in a commercial or Planned Residential District, or changes in use to existing buildings, including signs, require Site Plan Approval and/or Architectural Review by the Village of Hilton Zoning Board of Appeals. a minimum separation of eight (8) feet between any side and/or rear property lines, except sheds which require a minimum of five (5) feet between any side and/or rear property lines. 'In-Home' businesses are not allowed without prior approval. Application requests for Variances and Conditional Use Permits.